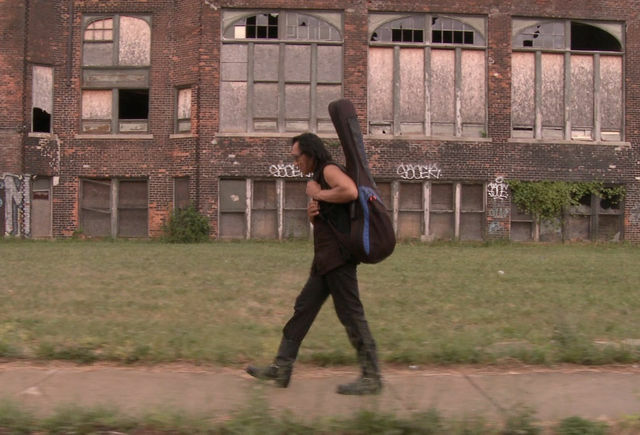 Someone in my book group recently recommended to me a DVD called Searching for Sugar Man. I don't normally buy DVDs, but it just happened that the shop in Bristol where she found it is on my beat at the moment, and so I went in and asked for it. It's a documentary, and it tells a real Cinderella of a story. 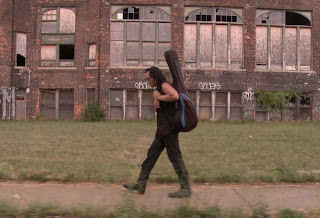 In the early 1970s, two eminent record producers discovered a singer playing his guitar in a bar in the back streets of Detroit. No-one knew much about him; he even played with his back to the audience and a hat shading his face, as if he shunned publicity and played only for the sake of his music. His tunes were melodic, the kind that stuck in your head; his words were intriguing and seemed to come from the heart. He reminded them of Bob Dylan, but with a sweeter voice. 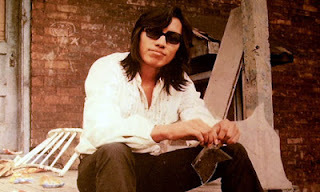 He was called Sixto Rodriguez. They made an album with him, using all their considerable expertise and resources, and, delighted with the results, they sat back to wait for America to fall at his feet. But it didn't happen. There was nothing but a resounding silence. Inexplicably, it bombed, as did the next one. Talking about this in the film, one of the producers was almost in tears, even after so many years: he simply could not understand why it failed. The record company let him go, just before Christmas: prophetically, one of his songs had been the story of a man who lost his job two weeks before Christmas. That would have been the end of the story. But unbeknown to anyone in America, somehow or other a bootleg recording found its way to South Africa, where his protest songs found an echo in the hearts and minds of the people there who were rising up against apartheid. Over the next twenty years, Rodriguez became huge in South Africa: anyone who had a record collection would have his music in pride of place. It was the background to their lives. No-one knew anything about him. There were rumours that he had committed an ultimate act of protest or despair, and killed himself on stage. Eventually, two South African fans decided to investigate. As far as they were able, they followed the money: to whom had the profits from all his record sales gone? The trail grew blurred, but in the end, they found a different lead - and a simple phone call established that Rodriguez was not tragically dead; he had simply returned to his life as a builder, and continued to live in the same house he'd always lived in. No-one he worked with had a clue about his early brush with fame, and he had absolutely no idea about his extraordinary popularity on another continent. Well, the two investigators went to see him. They persuaded him to visit South Africa, where he played concerts to thousands and thousands of ecstatic fans. He strolled out there into the spotlight as if he'd been doing it all his life. His voice was just as good as ever. And the profits from his new-found fame? He wasn't interested. Apparently, he has given much of the money from recent concerts and records away to family and friends. he still lives in the same house, and he doesn't give two hoots for all the lost profits from the million of his records sold in South Africa during the lost years. The film is absolutely gripping. It's just won a Bafta, and deservedly so. Of course, I could make a parallel between the undiscovered genius of this likable unassuming man, and the fate of who knows how many other artists - children's writers among them! - who have also languished in obscurity, in or out of a garret. But in truth, that isn't the point. I just want you to look out for this film, because it's the most feel-good work of art I've come across in a good while. And the music's good too! This is amazing Sue - I used to have both of Rodriguez's albums on tape cassette (those were the days) having made friends at university with someone who had grown up in South Africa and loved his music. I thought he was dead! It is great music - I'll have to search out the dvd. Thanks!! Will watch out for this on the Lovefilm list as it is unlikely to be at the local Odeon. Stories like this are so life-affirming though. I had heard of it a while back but once the BAFTA & OSCAR final BIG BIG titles come out, the "lesser" titles tend to get forgotten, even if they are hugely worth seeing, A bit like book awards really. bit of what was around in the early to mid 70's. Undemanding to listen to. enough to make it on it's own. Not the sweetness of the voice that counts, it's what you're saying with it. Here in the UK, an approximate equiv might be Nick Drake, who recorded his songs, but was unwilling or unable to do the groundwork of pubs, clubs, promotion. His music didn't sell, Drake didn't understand why, and killed himself. Having said which, the story is good. And back then, I loved The Doors, Frank Zappa..., so perhaps I'm not a natural for Rodrigues's music. My son told me about this documentary just this week. Rodriguez's music was certainly what we were all listening to in Cape Town in the late 60's. Whether it can compare favourably with the rest of what was out there at the time doesn't really matter. For me the sounds were the background thread of that time when I had just left school and was a student in the city and suddenly free! its marvellous that they've traced him and done the documentary. I was planning to watch it this week-end. My son jokes that I hung around in a flower painted VW in my student days! Meant to say I've been out the country thats why this late comment but thanks for posting this Sue.